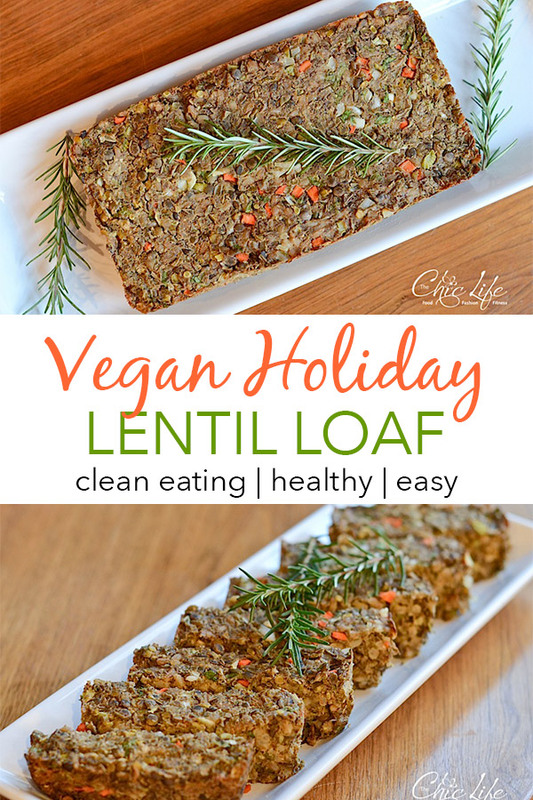 Vegan Lentil Farro “Meat” Loaf Recipe – Great for Thanksgiving, Christmas, or Everyday Eating! I’ve finally found something that I know more about than my dad, and it’s only taken 33 years to get here. You see, in recent months, my dad has gone vegan. Typically, he’s the expert on nearly everything in our family. I like to call him a “walking encyclopedia” because he knows so much about so many things. But veganism is something that is new to him but not to me. I’m far from a vegan expert, but over the last couple of years, I’ve played around with vegan recipes (both making and creating them) here and there because I think they’re really interesting and fun to do (especially the desserts!). But now, I have a pretty good reason to come up with even more vegan recipes – to help my dad and family enjoy his new style of eating. Plus, they sort of asked for my help. My family recently requested my help to make our vegan-friendly Thanksgiving dinner. We made pretty much everything vegan except for the turkey and ham. But, I also wanted to give my dad a meat-free entrée that he could enjoy. I thought about making things like veggie burgers or grains mixes, but I really wanted to come up with something that would be hearty. Something you could cut into with a fork and knife. And something that would be great with a little gravy on top, keeping in line with the Thanksgiving theme. 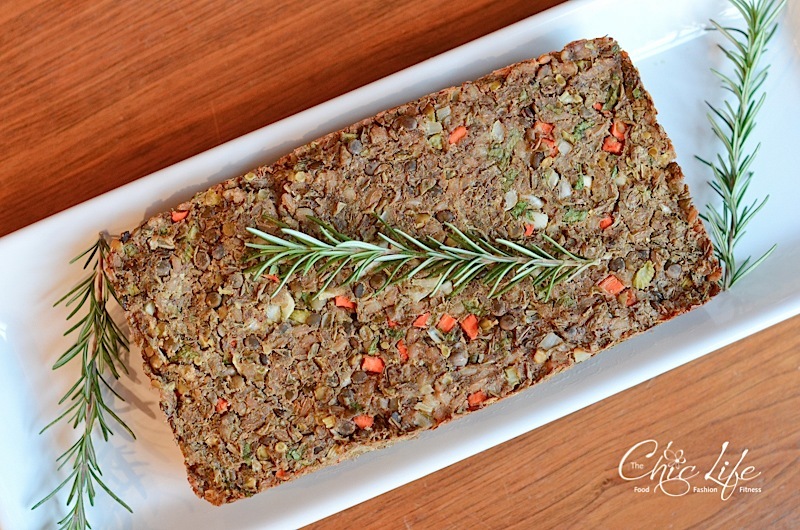 I ended up making a Vegan Lentil Farro “Meat” Loaf Recipe. As I considered my options, I decided on making a “meat” loaf. I want to make another one of these in the future but more like the classic style with ketchup brushed on top. This version is worthy of enjoying at a holiday dinner (but that is flexible enough to also work as an everyday dish). 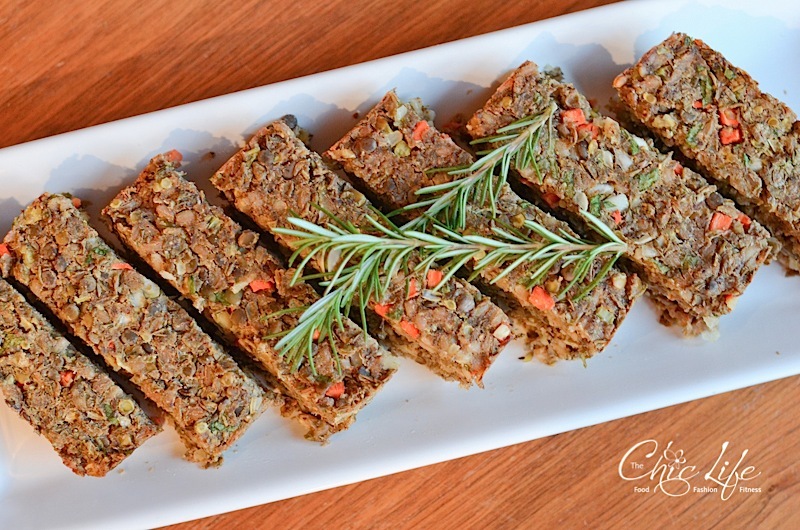 I added carrot, celery, and eggs (traditional turkey fillings for baking) and rosemary (an herb that reminds me of Thanksgiving and is one of dad’s favorite flavors). Oh, and I added parsley, too, because my whole family can’t really get enough of this. We love how it adds color and freshness. One really important thing for me was to make sure the recipe was simple and straightforward, using as many basic (non-specialty) ingredients as possible. When my sister was trying to find recipes, she commented on the long ingredient lists she was seeing and not having many of the unique ingredients in them. I tried to keep this one as simple as possible, so this could be a good entry-level recipe for someone newer to meatless meals. 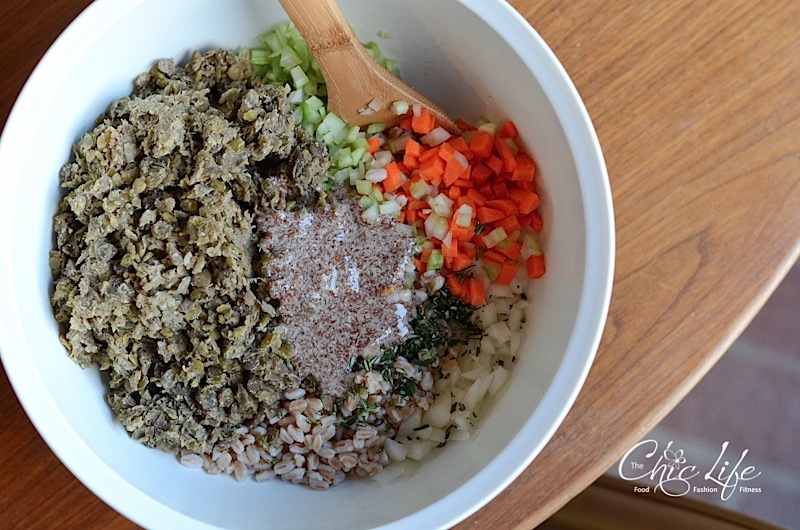 The lentils are the main ingredient for this Vegan Lentil Farro “Meat” Loaf Recipe, but they’re also part of what helps the loaf bind together. I followed this article by The Kitchn for lentil cooking tips, but I normally like to cook mine almost al dente…with a little bite and firmness. I ended up overcooking mine by quite a bit (about 8-10 minutes) for this recipe, until they were soft enough to mash up. 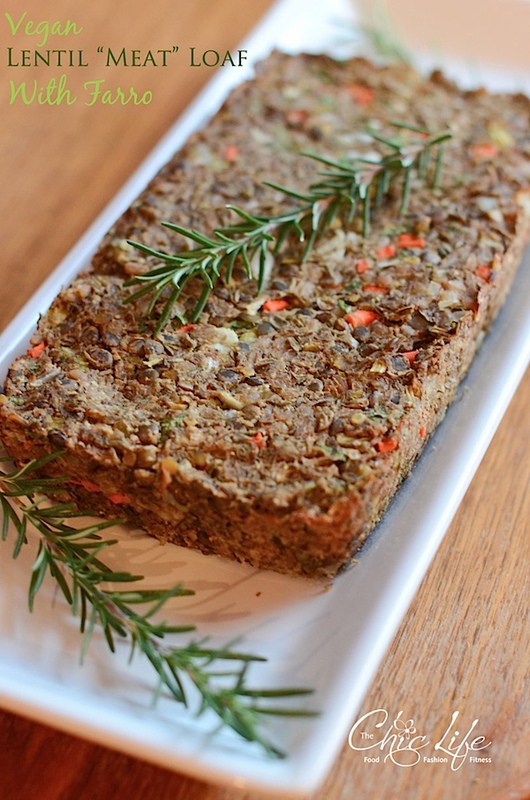 You want the lentils to be able to stick together a bit so the loaf doesn’t fall apart. I was originally going to add rice to this recipe since we were already doing a lot of other cooking for Thanksgiving and mom always has cooked rice on hand, but since it was dad’s special dish, I decided to go the extra mile to add a healthy whole grain – farro. I tried cooking 1 cup of dried farro, but when I looked at the cooked product, it was way too much. I didn’t want there to be too much farro because I was afraid it would make the loaf fall apart, so I saved half of the cooked grain for later (and made a breakfast porridge with it – that recipe is coming soon! 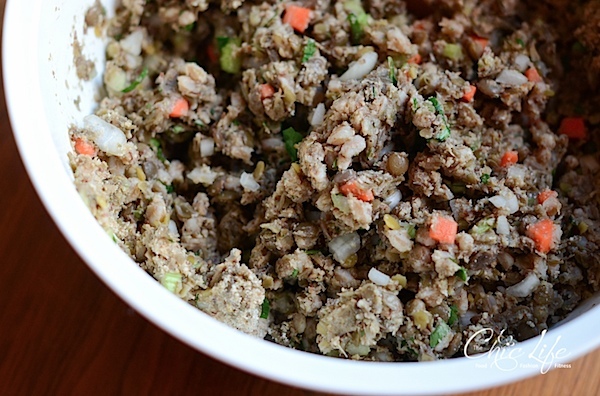 ), and I listed only 1/2 cup dried farro in the recipe below. I do think rice is a fair substitution if you’d rather have that or if you’re trying to make this recipe gluten-free. 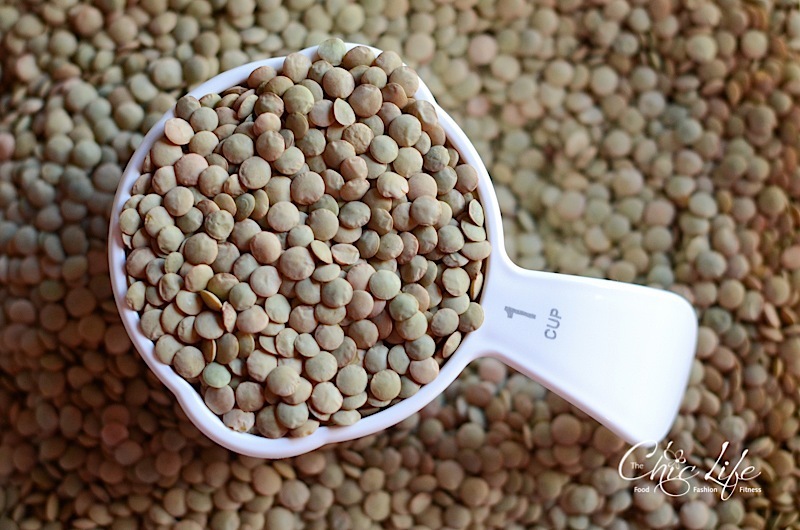 Here’s a close-up picture of the cooked lentils – see how they stick together a bit, even though I didn’t fully mash the lentils? Flaxseed eggs are another key binding ingredient. 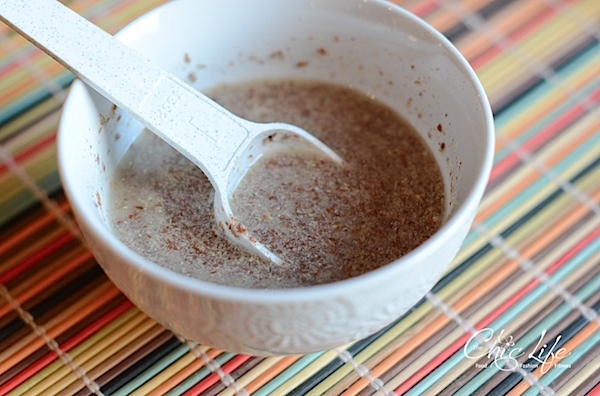 The key is to mix these together and let them sit for about 10 minutes so the mixture becomes thicker and more sticky. Combine most ingredients in a large bowl and stir together. 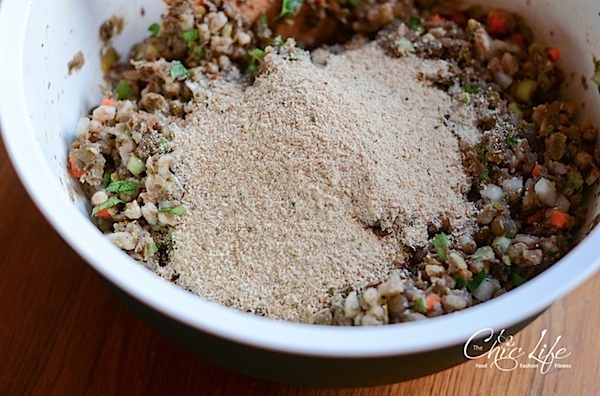 Mix in bread crumbs, salt, and pepper last. Make sure you taste test the mixture to see if it needs more salt, pepper, or other herbs. Pour/spoon into the loaf pan and press the mixture down tightly so the loaf stays together. Above – you can see how different it looks when you compact it. The left side hasn’t been pressed in at all. Once it was, the level went down almost an inch! Here’s another shot to show you the height difference between the two sides. 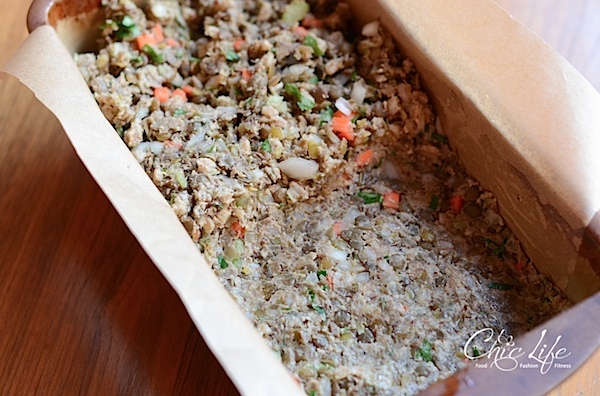 Once you pack the whole thing down, you should have a lovely little loaf ready for baking. 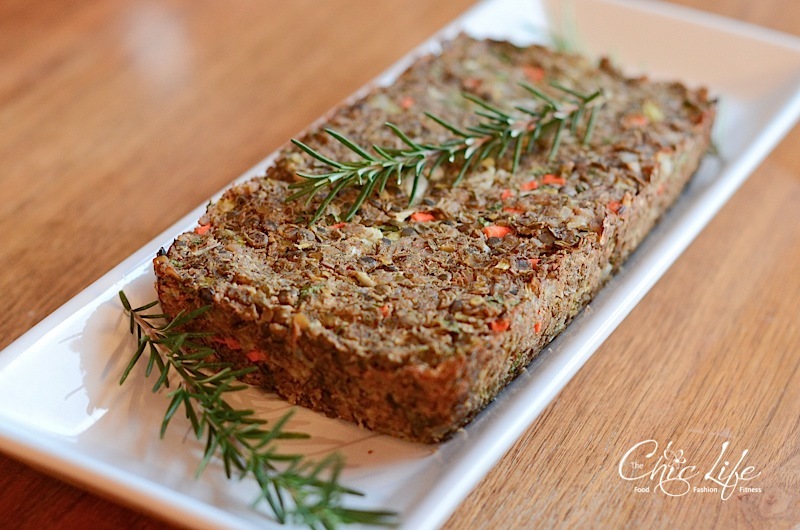 And here’s the finished product of the Vegan Lentil Farro “Meat” Loaf Recipe. My parents have plenty of rosemary outside so we used a couple sprigs to garnish. Thick slices help ensure the loaf doesn’t fall apart. 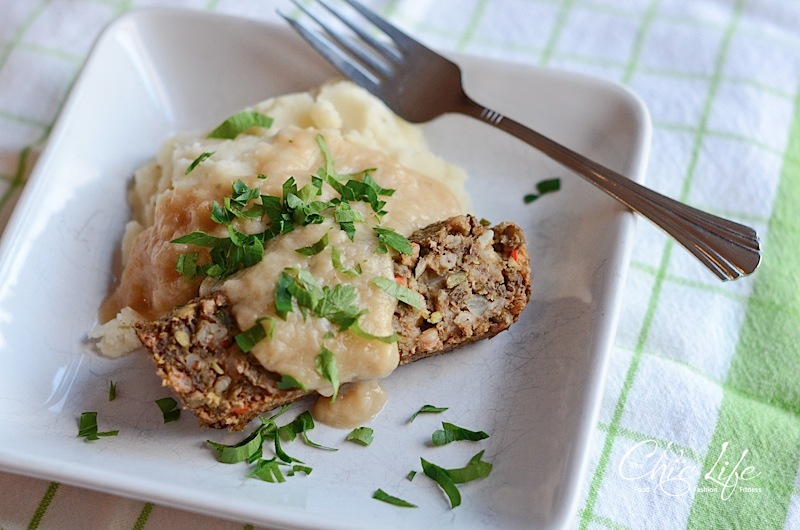 I veganized a class meatloaf recipe, switching out some flavors to make this more Thanksgiving/Christmas/holiday-themed so it goes perfectly with a drizzle of gravy on top. Make sure you cook the lentils long enough so that they can mash up and help bind the loaf (see tips above). The flaxseed eggs and breadcrumbs are important binding ingredients that help the loaf stay together, too, so don’t skip those. Packing the mixture tightly and cutting thicker slices also helps the loaf keep from crumbling apart. If you’re looking to save time, you can cook the lentils and farro ahead of time. Read through the blog post above to see more of my preparation tips and photos. 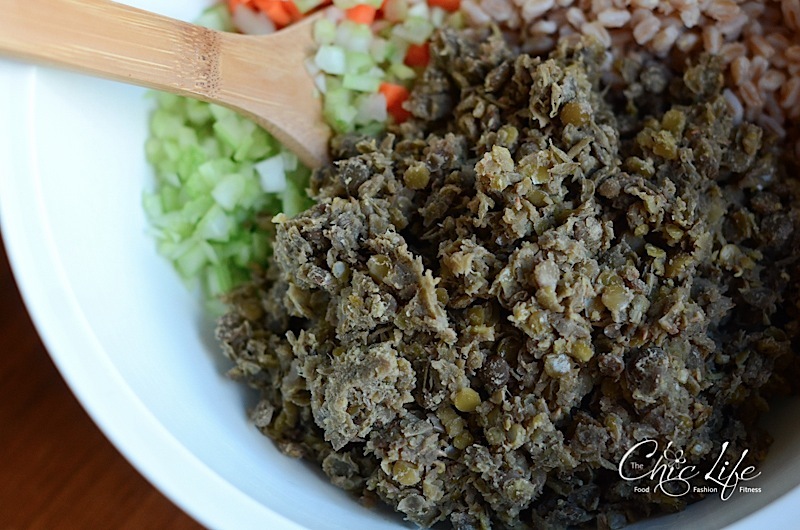 This recipe was designed for my newly vegan dad, but my meat eating mom and sis also really enjoyed it, as did I.
Stir together the flaxseed egg ingredients and set aside to gel up (about 5-10 minutes). Pre-heat oven to 350 degrees F. Brush a loaf baking dish with oil and line with parchment paper (I just line the wide side with a long strip cut to fit the width with the paper reaching just over the tops of the sides of the pan, so you can pull on them like a little loaf lift). Mash the lentils. 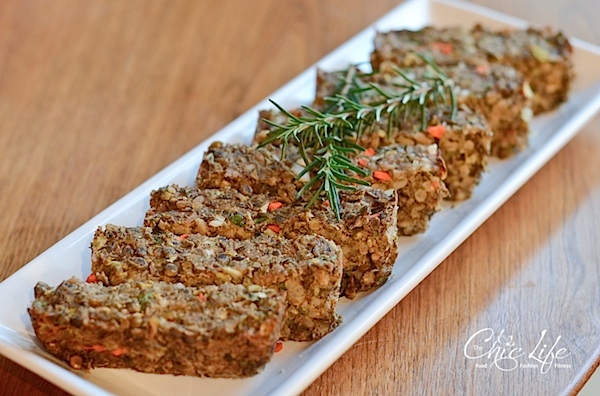 In a large bowl, combine lentils, faro, onion, carrot, celery, flaxseed mixture, and rosemary. Stir until evenly combined. 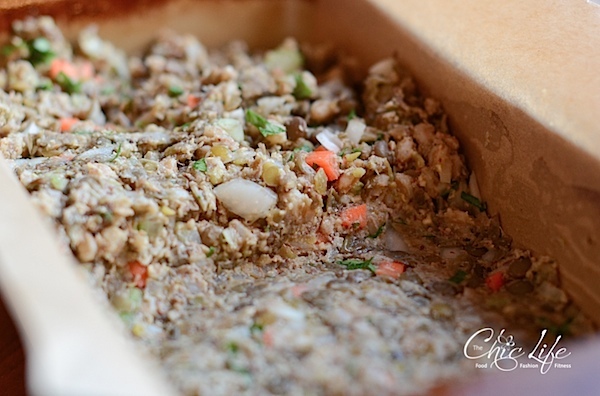 Mix in bread crumbs, salt, and pepper. Taste test the mixture and add additional salt, pepper, and herbs, if needed. Pour mixture into prepared baking dish and press very firmly to an even layer. Let cool until safe to handle. Slice, serve, drizzle with vegan gravy, and enjoy! Fresh parsley makes a great garnish. Note: Prep time is about an hour (including time to cook the lentils and farro) – if you pre-cook the lentils/farro, it won’t take long at all. Yields: about 8 slices, depending on how thick you cut them. 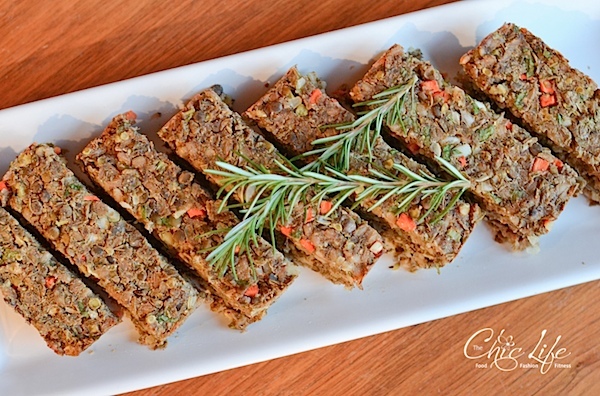 If you’re researching for Christmas, this Vegan Lentil Farro “Meat” Loaf Recipe would be great for then, too. Go ahead and bookmark and save this link for later! If you liked this post, please use a share button at the end of the post to spread the word with your friends and family. There’s also a link to email this post! Thanks for reading about my Vegan Lentil Farro “Meat” Loaf Recipe! Happy (vegan) eating! This looks delicious. Farro is a new ingredient to us this year and this sounds like a great way to use it. Appreciate the vegan recipe as we are dairy and egg free over here due to breastfeeding issues! 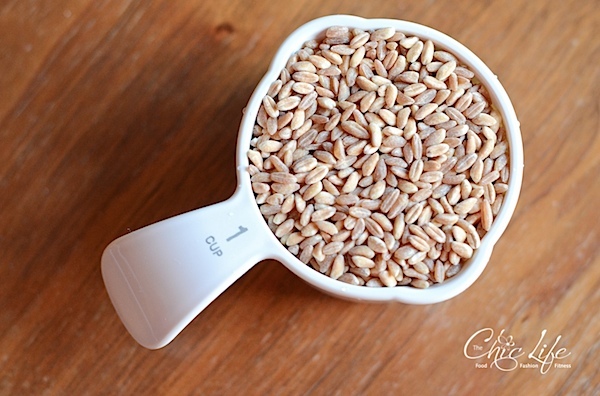 I have some more great farro recipes! Oh man! This looks so good!! Can’t wait to try it! I’m sending the recipe to my mom right now so we can possibly try it for Christmas! I have been meaning to make a vegan meatloaf recipes for (literally) years. Maybe this holiday season I’ll actually get around to it – this looks so delicious.